Harlan Tarbell said to this publication: "The greatest work ever published on Linking Rings." 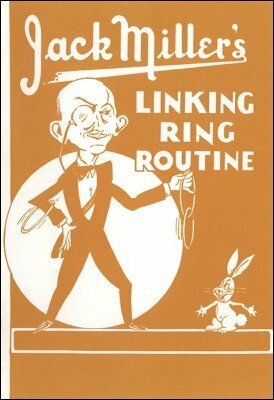 Jack's long cherished secrets are yours in his ring through ring, ring through arms, special three-ring routine, a.s.o. On top of the linking ring instructions Jack Miller also shares with you a separate chapter on ring and rope penetrations. These latter methods are so ingenious and puzzling as to seem uncanny, and are rarely seen performed. 1st edition 1945, 32 pages; 1st digital edition 2016, 30 pages.